Chronic ankle pain and injuries make performing daily tasks, and everything else, difficult. At Florida Orthopedic Foot & Ankle Center, the team of board-certified orthopedic foot and ankle specialists offer minimally invasive arthroscopy procedures. By using cutting-edge technology, they treat your condition and get you back on your feet quickly. Contact the team-lead Dr. James Cottom, who helped pioneer arthroscopy surgery for ankle instability. If you live in or near Sarasota, Florida, call the office today or go online to schedule. Arthroscopy is surgery that uses a tiny camera and surgical tools to examine or repair the tissues inside or around your ankle and other joints within the foot. The camera is called an arthroscope. The procedure allows the surgeon to detect problems and make repairs without making larger cuts in the skin and tissue. This means that you may have less pain and recover more quickly than open surgery. Most patients will have regional anesthesia during the procedure. Your leg and ankle area will be numbed so that you do not feel any pain during the procedure and for several days after. If you receive regional anesthesia, you will also be given medicine to make you very sleepy during the operation. 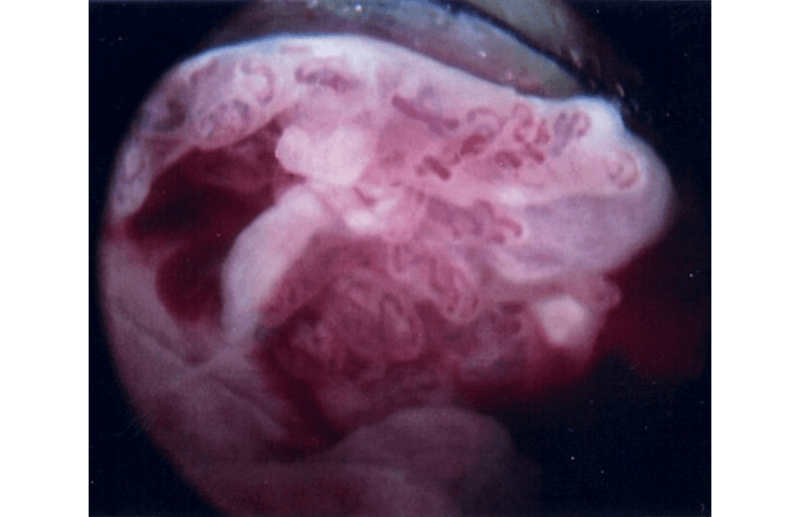 Patients do not feel, see, hear or remember anything during the procedure! inspects all the tissues of your joint. These tissues include cartilage, bones, tendons, and ligaments. What are the indications for Ankle and Foot arthroscopic surgery? Ankle arthritis: Ankle fusion is a treatment option appropriate for many patients with end-stage ankle arthritis. 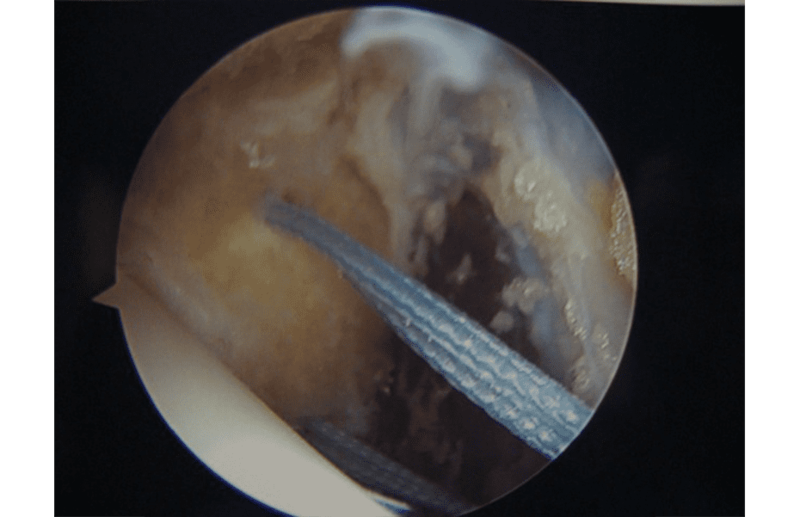 Ankle arthroscopy offers a minimally invasive way to perform ankle fusion. Results can be equal to or better than open techniques. Arthroscopic Ankle Fusion. 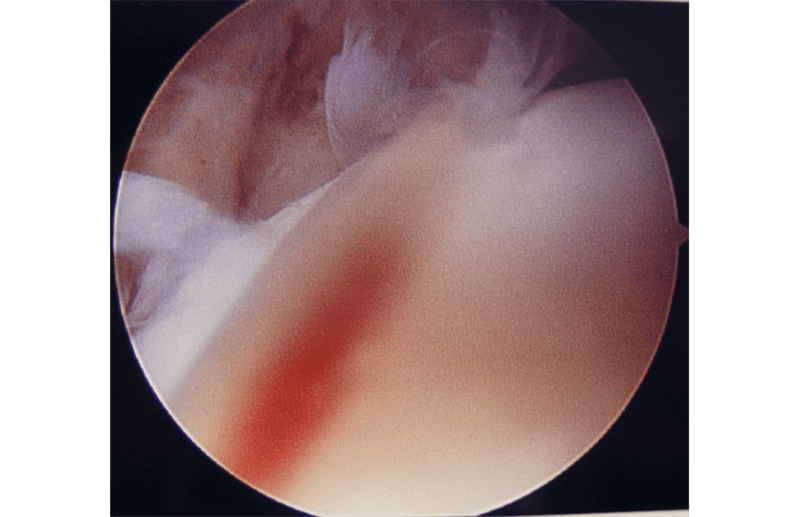 All cartilage is removed with arthroscopic instrumentation and the joint is fused with screws that can be placed through the skin with extremely small incisions. 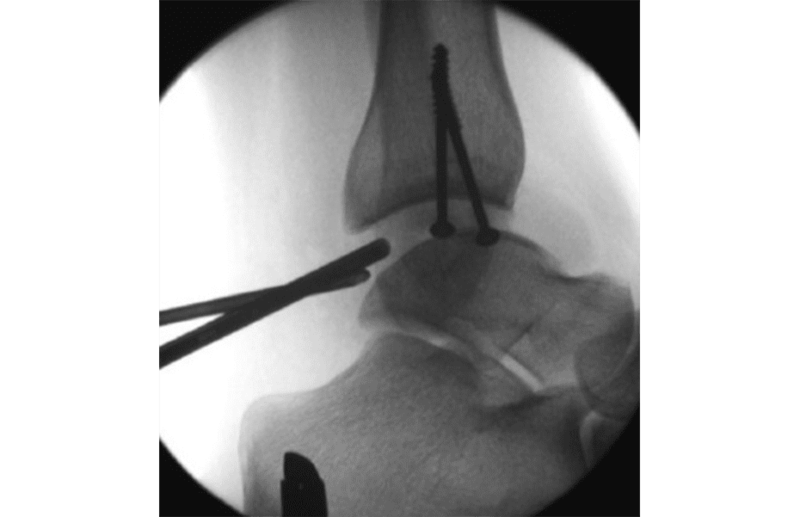 Ankle fractures: Ankle arthroscopy may be used along with open techniques of fracture repair. This can help to ensure normal alignment of bone and cartilage. It may also be used during ankle fracture repair to look for cartilage injuries inside the ankle which often occur. Dr. Cottom will often include a scope when he fixes ankle fractures as there is a high incidence of cartilage damage as well. The scope is used to help achieve perfect reduction of a distal tibial fracture. Ankle instability: Ligaments of the ankle can become stretched out, which can lead to a feeling that the ankle gives way. This can also cause abnormal loading of the joint and damage to cartilage and other structures around the ankle. 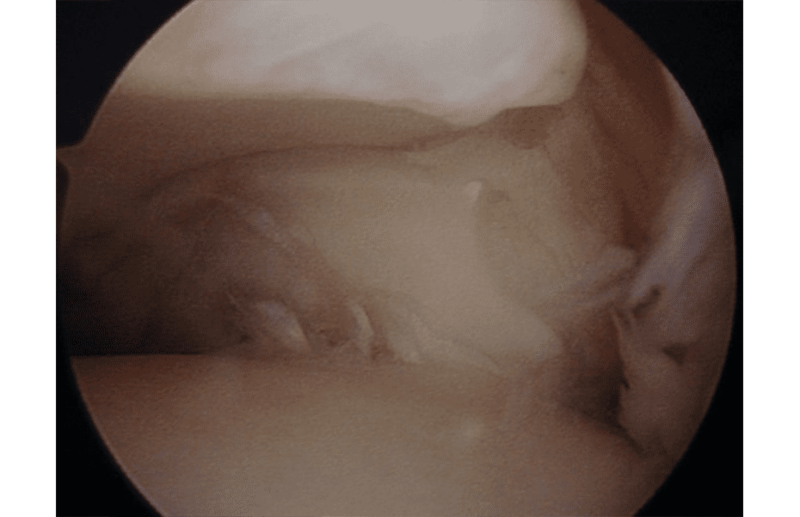 Dr. Cottom has helped pioneer surgical techniques for these problems and has published several papers on the “All-Inside” Arthroscopic Brostrom Procedure in peer reviewed journals. Anterior ankle impingement: Ankle impingement occurs when bone or soft tissue at the front of the ankle joint becomes inflamed. Symptoms include ankle pain and swelling. This can limit the motion of the joint and can often be very painful. Impingement band across the anterior lateral talus. This can cause pain and can damage the cartilage within the joint. Arthrofibrosis: Scar tissue can form within the ankle. This can lead to a painful and stiff joint. This is known as arthrofibrosis. 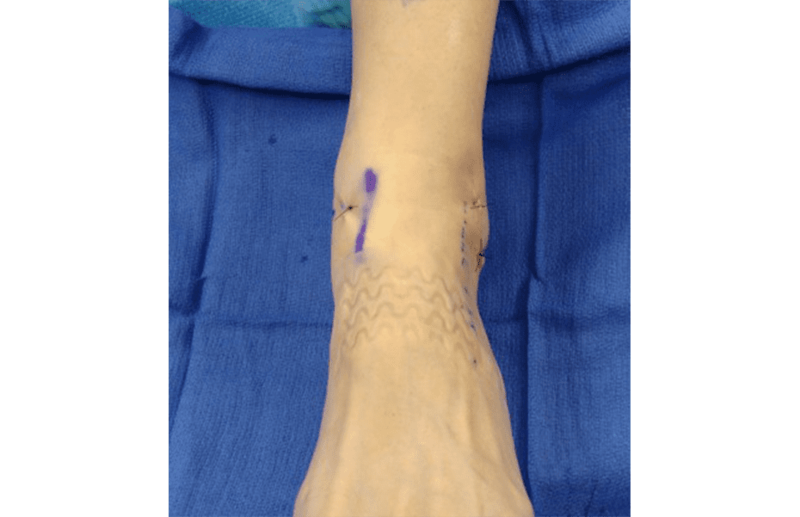 Ankle arthroscopy can be used to identify the scar tissue and remove it. Arthrofibrosis in the anterior lateral ankle joint as a result of chronic lateral ankle instability. Infection: Infection the joint space cannot be treated with antibiotics alone. 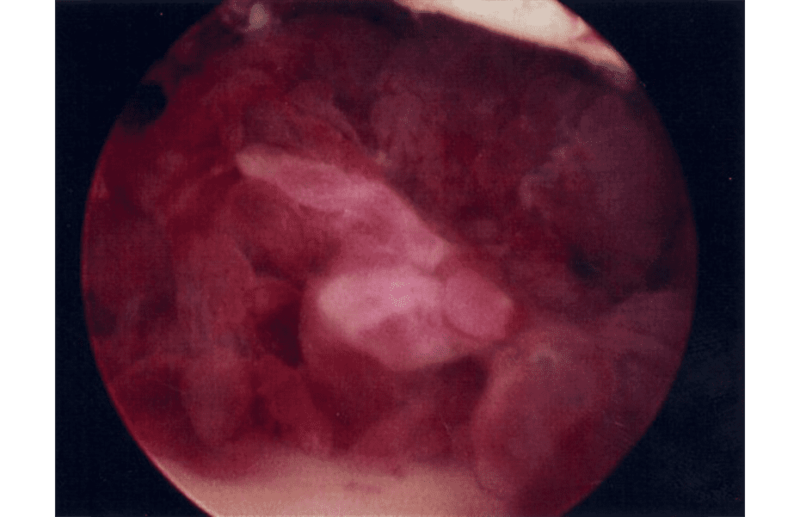 It often requires an urgent surgery to wash out the joint. This can be done with arthroscopy in some cases. Loose bodies: Cartilage, bone and scar tissue can become free floating in the joint and form what is referred to as loose bodies. Loose bodies can be painful and can cause problems such as clicking and catching. They can also damage healthy cartilage. Locking of the ankle joint may occur. 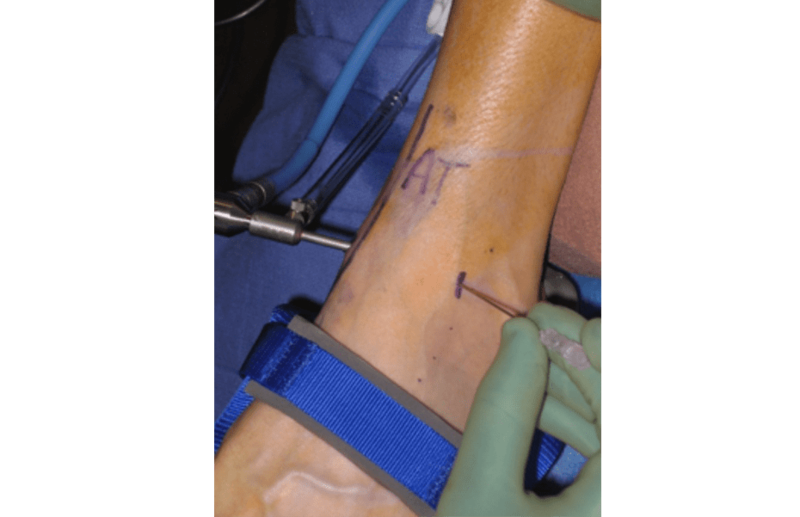 Ankle arthroscopy can be used to find and remove the loose bodies. Osteochondral defect (OCD): These are areas of damaged cartilage and bone in the ankle joint. OCDs are usually caused by injuries to the ankle such as fractures and sprains. Common symptoms include ankle pain and swelling. Patients may complain of catching or clicking in the ankle. The diagnosis is made with a combination of a physical exam and imaging studies. 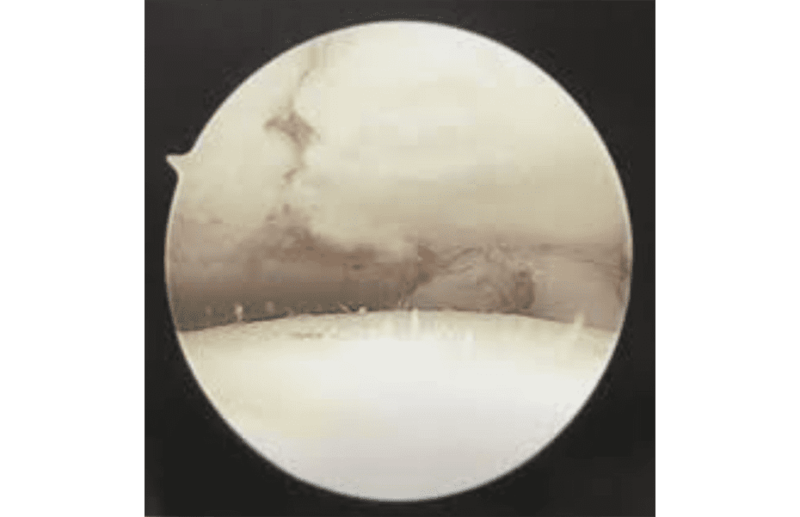 Imaging may include X-rays, MRI or CT scan. The treatment is based on the size, location and stability of the OCD. The patient’s symptoms and activity demands are also considered. 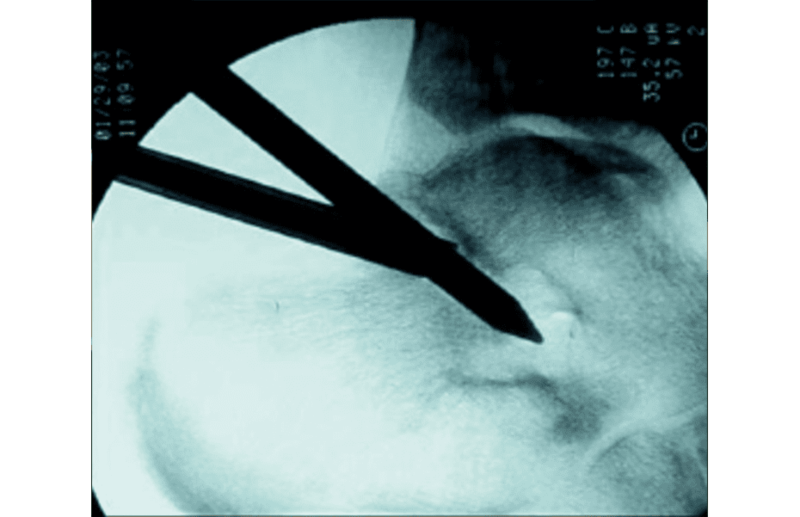 Surgery often consists of scraping away the damaged cartilage and drilling small holes in the bone to promote healing. Bone grafting and cartilage transplant procedures are often performed by Dr. Cottom. Technology has allowed us to use dehydrated cartilage and repair these lesions with excellent long term outcomes. 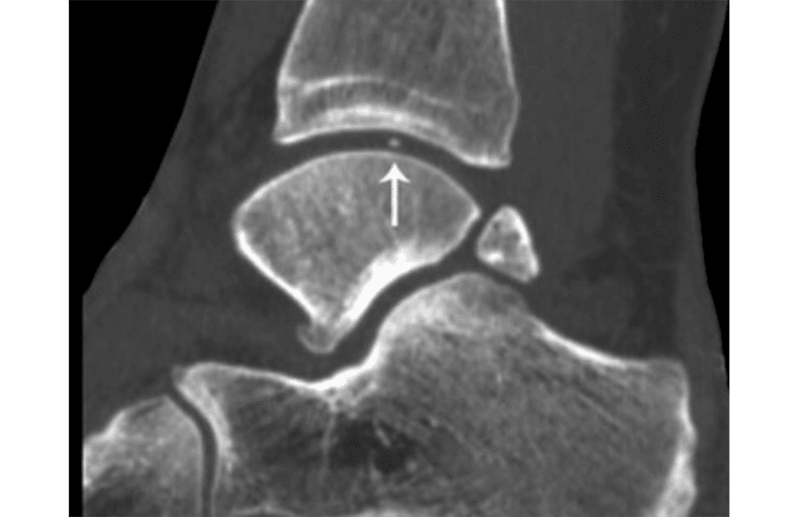 Osteochondral lesion of the talus. Note how the cartilage is lifted off the bone. Posterior ankle impingement: This occurs when the soft tissue at the back of the ankle becomes inflamed. Pointing the foot down can be painful. This overuse syndrome occurs commonly in dancers. It can be associated with an extra bone called an os trigonum. 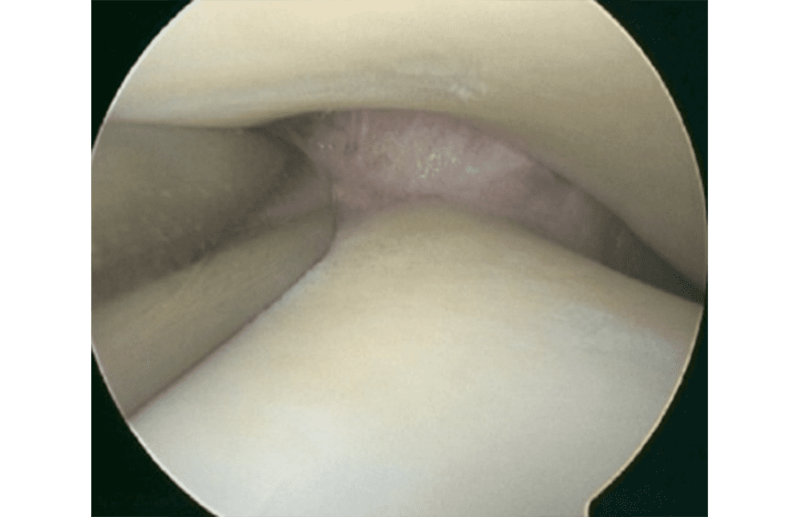 The problem tissue can be removed with arthroscopy and if there is any irritation to the FHL tendon, it can be addressed at the same time. Synovitis: The soft tissue lining of the ankle joint (synovial tissue) can become inflamed. This causes pain and swelling. It can be caused by injury and overuse. Inflammatory arthritis (rheumatoid arthritis) and osteoarthritis can also cause synovitis. Ankle arthroscopy can be used to surgically remove inflamed tissue that does not respond to nonsurgical treatment. Generalized ankle Pain: Occasionally patients develop symptoms that cannot be explained by other diagnostic techniques. We will often inject the joint which provides valuable information on a patients given problem. These injections are done in the office and are both diagnostic and theraputic. 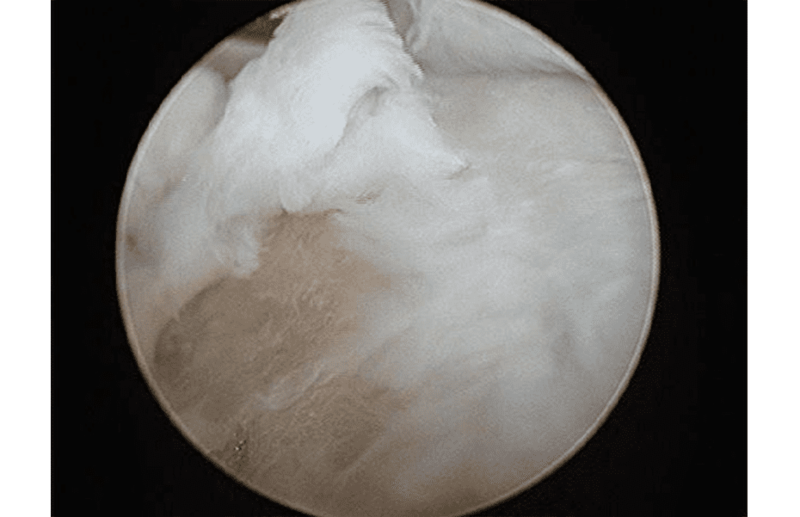 Arthroscopy is also an option that provides the opportunity to look directly into the joint. The surgeon can then identify problems that may be treated with surgery. At the end of the surgery, the incisions will be closed with stitches and covered with a dressing (bandage). Most surgeons take pictures from the video monitor during the procedure to show you what they found and what repairs they made. The subtalar joint is located under the ankle joint. It is the joint between the talus (on top) and the calcaneus or heel bone (on the bottom). Arthroscopic procedures can also be performed within this joint similar to the ankle joint. Dr. Cottom uses a smaller scope in these cases as the joint is much smaller than the ankle. Arthritis, loose bodies, synovitis, pain, impingement, fusion, assisted fracture reduction and osteochondral lesions are all conditions amenable to this type of surgery in the subtalar and smaller joints of the foot. At Florida Orthopedic Foot & Ankle Center, we have the experience that is required in these technically challenging smaller joint arthroscopic procedures. Tell your health care provider what medicines you are taking. This includes medicines, supplements, or herbs you bought without a prescription. You may be asked to stop taking medicines that make it harder for your blood to clot. These include aspirin, ibuprofen (Advil, Motrin), naproxen (Naprosyn, Aleve), and other medicines. Ask your provider which medicines you should still take on the day of your surgery. If you have diabetes, heart disease, or other medical conditions, your surgeon will ask you to see your doctor who treats you for these conditions. Tell your provider if you have been drinking a lot of alcohol, more than 1 or 2 drinks a day. If you smoke, try to stop. Ask your health care provider or nurse for help. Smoking can slow wound and bone healing. Tell your doctor about any cold, flu, fever, herpes breakout, or other illness you may have before your surgery. Follow instructions about when to stop eating and drinking before the procedure. Take the medicines your provider told you to take with a small sip of water. Follow instructions about when to arrive at the hospital. Arrive on time. You can usually go home the same day after you recover from the anesthesia. You should have someone drive you home. Keep your ankle elevated above your heart for 2 to 3 days to help reduce swelling and pain. You can also apply cold packs to reduce swelling. Keep your bandage clean and dry. Follow instructions for how to change the dressing. You can take pain relievers, if needed, as long as your doctor says it is safe to do so. You will need to use a walker or crutches and keep weight off your foot. The small cuts will heal quickly, and you may be able to resume your normal activities in a few days. But, if a lot of tissue in your ankle had to be repaired, it may take several weeks to heal. How quickly you heal depends on how complicated the surgery was. You may be shown how to do gentle exercises as you heal. Dr. Cottom will almost always recommend that you see a physical therapist to help you regain the full use of your lower extremity after your procedure.